Round Butte Dam and the Selective Water Withdrawal Tower. There’s been a great deal of focus on how Selective Water Withdrawal (SWW) operations at Pelton Round Butte have impacted temperatures in the lower Deschutes River. It’s hard not to focus on temperature: it’s something we can easily sense and monitor, and increased spring and summer temperatures have led to some alarming changes in the lower river these last few years. But to understand the full extent of the ecological changes occurring in the lower river, there’s another criteria that’s perhaps even more important: hydrogen ion concentration, better known as pH. pH levels in the lower Deschutes River have increased dramatically since SWW operations began, and discharges from the Pelton Round Butte complex have routinely violated Oregon’s pH standard. Why is this happening, and how are these increased pH levels impacting the lower Deschutes River? pH is a numeric scale used to indicate the acidity or basicity of a water-based solution. Pure water is neutral, with a pH of 7 standard units (SU). Solutions with a pH above 7 SU are basic (alkaline), and solutions with a pH below 7 SU are acidic. pH is measured on a logarithmic scale, meaning that a pH of 9 is ten times more alkaline than a pH of 8. In freshwater systems like the Deschutes River, high pH levels are often the result of increased photosynthetic activity. This is because photosynthesis lowers the dissolved CO2 concentration in the water, which in turn reduces the carbonic acid concentration, which raises pH. As a result, high pH levels are a useful indicator of excessive algal growth and nutrient enrichment in freshwater systems. Oregon’s water quality standard for pH in the Deschutes Basin is a minimum of 6.5 and maximum of 8.5 SU. This standard is designed to protect aquatic life from the harmful effects of water that is too acidic or too alkaline. While a pH above 8.5 is not lethal to aquatic life, it does not provide adequate protection; pH levels above 9.0 have been found to cause stress responses in rainbow trout, including sluggish movement, reduced feeding, and ammonia intoxication. High pH also indicates excessive algal growth in the river. The water quality certification for the Pelton Round Butte Complex mandates that discharges from the Project fall within this 6.5-8.5 range, to ensure that Project discharges comply with Oregon’s pH standard and that aquatic life in the lower river is adequately protected. Since SWW operations began, Project discharges have routinely exceeded the 8.5 maximum standard. In 2016 alone, PGE’s own data show 140 days that pH levels rose above 8.5 at the Reregulating Dam tailrace. While these numbers are alarming, downstream the problem appears to be even worse. In 2016, the DRA operated a data sonde one mile below the Reregulating Dam, collecting hourly readings for several water quality parameters, including pH, from February through November. Data collected at this site are summarized and analyzed in the DRA’s 2016 Lower Deschutes River Water Quality Report. The pH data collected at this downstream sampling site are truly concerning. Of the 279 days sampled, 234 days had some pH measurements that exceeded the upper pH standard of 8.5. 120 of these days had pH measurements recorded above 9.0, and pH levels did not drop below 8.5 throughout April, May, and June. pH rose above 9.5 (remember, 10 times more alkaline than a pH of 8.5, and a hundred more times alkaline than a pH of 7.5) on two occasions: July 12 and October 14. It makes sense that pH levels one mile downstream would be even higher than those in the Reregulating Dam tailrace. Increased algal growth in the river below the Project is increasing the amount of photosynthesis occurring in the river—this increased photosynthesis, in turn, continues to drive up pH levels downstream. What do These Violations Mean, and Why are They Happening? These newly elevated pH levels in the lower Deschutes River raise two important questions. First, what do these highly alkaline levels mean for the ecology of the lower river? As indicated above, in freshwater systems high pH levels are a strong indicator of excessive algal growth caused by nutrient enrichment. This will come as no surprise to anyone who has seen (or slipped on) the now-omnipresent nuisance algae blanketing the lower river’s rocks for much of the year. And such a high level of sustained pH poses definite stress and health risks to aquatic life including salmon, steelhead, and resident native trout. Algae on rocks, one mile below the Pelton Reregulating Dam. The next question that must be asked is: why is this happening? What is responsible for these elevated levels of pH? The only realistic answer appears to be the commencement of SWW operations. Before SWW operations began in December 2009, discharges from the Pelton Round Butte Project did exceed Oregon’s pH standard from time to time. But these exceedances were relatively rare: PGE and the Confederated Tribes of Warm Springs, in their 2001 application for the Project’s water quality certification, identified only one instance between 1994 and 1999 where pH below the Reregulating Dam exceeded 8.5. In 2007-2009, the three years immediately before SWW operations began, PGE’s water quality reports show far fewer violations of the 8.5 standard. Further, Oregon DEQ data collected at the Warm Springs Bridge from 2005-2015 show an immediate and sustained increase in exceedances of the 8.5 standard upon commencement of SWW operations. Clearly, surface water releases through the SWW tower have had a significant impact on pH levels in the lower Deschutes River. This surface water originates in the Crooked River, the warmest of the three tributaries that enter Lake Billy Chinook, and the tributary with the highest nutrient concentration. 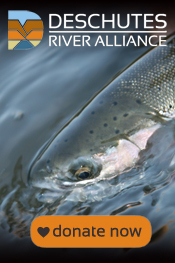 As a result, more surface water release means more nutrients are transferred to the lower Deschutes River. This in turn has triggered a significant increase in the growth of periphyton algae in the lower river, which has increased photosynthesis, and pH levels along with it. The encouraging news about these harmful pH levels is that the solution is right in front of us. To lower pH to levels that are again safe for the river’s aquatic life, the Project operators can significantly increase the percentage of water drawn from the bottom of Lake Billy Chinook. Doing so would slow the Project’s nutrient transfer to the lower river; this would be beneficial not only for pH, but also for the health and diversity of the lower river’s aquatic insect populations and the fish and wildlife that depend on them. The Pelton Round Butte Project’s current pH violations are at the root of our Clean Water Act lawsuit against Portland General Electric. We’ll be working diligently this year to ensure that these violations—and their resulting ecological impacts—are addressed. Wagner, E.J., T. Bosakowski & S. Intelmann (1997). Combined Effects of Temperature and High pH on Mortality and the Stress Response of Rainbow Trout after Stocking. Transactions of the American Fisheries Society. 126:985-998. This entry was posted in DRA Water Quality Monitoring, Ecological Changes, River Thoughts, Uncategorized and tagged algae, Deschutes River, Deschutes River Alliance, Lower Deschutes River, Pelton Round Butte Hydroelectric Complex, pH, redband trout, water quality. Bookmark the permalink. ← It’s the DRA’s Fourth Anniversary! Help Us Celebrate and Move Forward.